Kiribati, an island nation in the central topical Pacific Ocean composed of 32 atolls and one raised coral island, bordering the International Date Line at the easternmost point has a total land area of 313 square miles and a population of close to 100,000. Per geographical technicalities, Kiribati is the only country located on all hemispheres. With very little natural resources, it is ranked as among the world’s poorest and least developed countries. Copra, seafood and tourism are the bulk of the economy. The main sources of income are fishing license fees, remittances, grants and investment income. April through October is the best time to visit Kiribati. Beautiful white sand beaches, lagoons, and coral reefs beckons the visitor. Wildlife sanctuaries, bird watching, fishing, diving, cultural shows, and water-sports are other reasons to visit this Micronesian island. Its cuisine is also a major draw. Dishes can either be sweet, salty, sour or bitter. Gourmet dishes call for ample coconut and/or coconut milk. Vegetables, meat and all sorts of seafood are part of their diet. The first stamps of Kiribati were a set of two stamps released on July 12, 1979 in the Independence theme. The set (Scott #325 to #326) is inexpensive and catalogs for less than a dollar MNH or used. The designs show Kiribati Flag, and the Parliament in London and the Assembly in Tarawa. The islands were part of the crown colony of the Gilbert and Ellice Islands which also included Christmas Island and the Phoenix Islands. 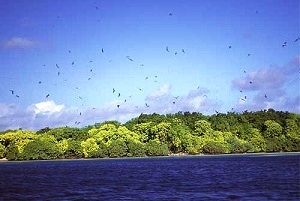 Gilbert and Ellice Islands gained self-rule in 1971. The Gilbert Islands along with the Banaba, the Line Islands, and the Phoenix Islands together became independent and separate as Kiribati on July 12, 1979. A long set of eighteen stamps released between 1982 and 1985 in the Birds theme. The set (Scott #384 to #399) catalogs for around $30 MNH and a little less for used. The designs show Pomarine jaegers, mallards, collared petrels, blue-faced boobies, friendly quail dove, shovelers, Christmas Island warblers, Pacific plovers, reef herons, brown noddies, brown boobies, Audubon’s shearwaters, white-throated storm petrels, bristle-thighed curlews, fairy tern, scarelet-breasted lorikeets, long-tailed cuckoo, and great frigate birds. A few other sets on the Birds theme were released over the years and most of them command a premium over regular issues from the same periods. A set of eight stamps released on May 2, 1994 in the Whales theme. The set (Scott #623 to #630) catalogs for around $15 MNH or used. The designs show Bryde’s whale, blue whale, humpback whale, and killer whale. Marine life is another common theme among Kiribati stamp issues. Fishing license fees are a good source of external income. A sheet of ten stamps and a souvenir sheet released on April 21, 2005 to mark the 60th anniversary of the end of World War II. The set (Scott #867a-j and #868) catalogs for around $20 MNH and around the same for used. The designs show Ha-Go tank invading Gilbert Islands, Japanese A6M Zero fighter on Gilbert Islands, USS Argonaut and Nautilus land Marines at Butaritari in Carlson Raid, Pacific Fleet Admiral Chester W. Nimitz, USS Liscome Bay sunk by Japanese submarine, US Higgins landing craft approaching Tarawa Red Beach, F6F-3 Hellcats providing air cover over Tarawa Red Beach, LVTs hit the shore at Tarawa Red Beach, Sherman tank at Tarawa Red Beach, US Marines take over on Tarawa Red Beach, and Australian Prime Minister John Curtin and British Prime Minister Winston Churchill. Battle of Tarawa was fought between the US Marine Corps and the Empire of Japan from November 20-23 of 1943. It was one of the bloodiest battles for the US Marine Corps. Total casualties included close to 5,000 dead or injured on each side. US Navy also lost USS Liscome Bay in the battle which is also represented in the set. The first coins of Kiribati were Bronze Cents (100 Cents = 1 Dollar) issued in 1979 showing the National Arms in Obverse and Frigate Bird on Branch in Reverse. The first issues are inexpensive cataloging in the dollar range for BU. Prior to this, Australian coins were used in Kiribati. Kiribati has issued a number of commemorative coins including gold coins over the years. Coins $2 and up Common UNCs start around $2. Commemorative Proofs start around $10. Silver Commemorative Proofs start around $50. Millennium and other year sets, Gold and Platinum Proofs, etc go well into the 100s. Antiques $25 and up 19th century maps start around $25.